Northeast Record Retention, LLC is conveniently located in Hooksett, N.H., just north of Manchester. This family-owned, N.H. based company began in 1983 with self-storage units throughout the state. In 1998, the owners, Russ Letendre and Cindy Roberts, started the document storage portion of the business and in January of 2003 document shredding was added and has developed rapidly. In August 2004 the company broke ground on a state of the art document storage and document shredding facility one half mile north of the original building in Hooksett, N.H. The business moved into this new structure in November 2005 which gives the company much needed space to serve our current and future customers for years to come. This addition has added over 43,000 square feet of space and we can expand another 90,000 square feet. Currently the warehouse can hold 400,000 archive boxes and with the expansion we will be able to hold well over 1 million archive boxes for storage. 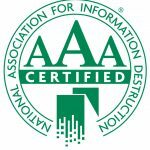 The company is a “Certified” member of NAID, (National Association for Information Destruction, Inc.) which is an international trade association whose mission is to promote the information destruction industry and the standards and ethics of its member companies. We are also a member of Prism. PRISM International (Professional Records & Information Services Management), which is a not-for-profit trade association for the commercial information management industry. This industry is made up of outsourcing partners that provide their clients with physical and digital information protection, access, retention, storage and disposal. shredding and record retention needs with a dedicated knowledgeable staff.